I am a huge fan of foraging, wildcrafting, and ethnobotany. As a result, I have been on many “wild weed walks.” Some of these have been strictly about food, some about medicinal properties. 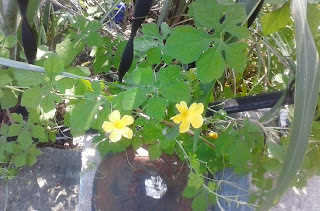 There is one plant that I have encountered a few times, on both kinds of walks, but until this summer I never had the pleasure of having it grow in my own back yard. Bitter Melon Momordica charantia is strikingly attractive, but terribly stinky (smells like old gym shoes). 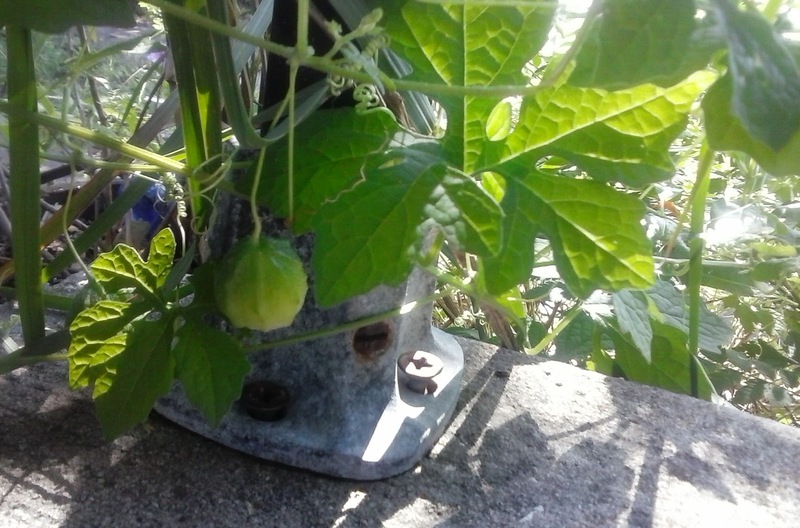 This vine has attractive green leaves, yellow flowers, and fruit that starts off green, but as it matures it turns a bright orange. When it’s finally ripe, it splits open in three parts, showing off the red arils (a fleshy coating around a seed). In Florida, it is considered a class II invasive, which means it is spreading in the wild but hasn’t done any significant habitat damage. It is, however, a major problem for citrus growers. Which means it’s great for those of us who like to harvest wild plants for food and/or herbal uses! Bitter melon, also called bitter gourd or wild balsam apple, is commonly used in the traditional dishes of many cultures, but it is only edible when it is green. It is toxic when ingested raw and has been attributed to several accidental pet deaths, dogs are particularly susceptible. The young leaves are also edible when cooked and drained. Bitter melon is packed full of wonderful nutrients, if you can get past the bitterness. A side note on the bitter flavor profile. In the USA, our diets are full of things that are not very good for us. This is causing most health professionals to see a major increase in digestive upset and disorders. One of the things we are lacking in our diets that could help with these issues is the bitter taste profile. Americans only really have one bitter flavor that they consume, and that’s coffee. Those of us that drink beer have another bitter flavor to add, but we even breed the “bitter” out of our greens now, mildly flavored greens are way more popular. The bitter flavor activates our bile production in our digestive tract. Bile helps us to digest fats and absorb more nutrients. If you consume something bitter at the beginning of (or even before) the meal, your digestion will improve greatly. Bitter flavors also helps with addictions, especially for those of us who are addicted to sugar because it helps to curb our cravings for sweets. If we would just add in a little bitter to our diets, we’d be much healthier as a nation. So, after that rant let’s get back to this wonderful plant. Bitter melon might be used as an edible, but it is best known for its medicinal properties. In recent years, I have seen a number of advertisements for various nutritional supplements that include bitter melon. These adds are targeting diabetics and people who want to lose weight and look young. Well, they’re not all wrong. Bitter melon is high in a number of vitamins and minerals, but it is particularly high in those that are considered antioxidants. Recently, there has also been lots of scientific research done on this plant. Most scientific studies have shown that the fruit has lots of promise in treating diabetes. Some doctors even recommend that diabetic patients eat the green fruit, or drink the juice of the same, on a daily basis. However, alcohol extracts (tinctures or bitters), while still working wonders on digestion, do not have an effect on diabetes. This is probably due to the alcohol part of the extract, as alcohol can have a detrimental effect on insulin levels. Traditional uses of this amazing plant abound. It detoxifies the blood and colon. It has been used, in other countries, to combat HIV/AIDS as well as certain types of cancers (including leukemia). Some cultures even believe that it can cure leprosy. The Amazonian natives use the leaf tea internally for diabetes and as a carminative (relieves flatulence), and topically for wound care, sores, and infections. It is also used, both internally and externally, to get rid of worms and parasites. In the traditional medicines of both Asia and Africa, it is used for digestive complaints, as a laxative, to enhance metabolism, and to increase both blood circulation and immunity. It is used in Ayurveda (the traditional Indian medical system) to help control fever, purify the blood, and reduce jaundice. Ayurveda also lists the gourd as beneficial to the liver, skin, and to help with “windy complaints.” Asians, Panamanians, and Columbians also use bitter melon to treat malaria. The list of benefits from this plant can go on, and on. It really is amazingly useful. I know that I already covered the fact that this plant can be toxic. However I wanted to stress caution with this plant as the nature of its toxicity is tied to its medicinal uses. Bitter melon toxicity causes “violent loss of fluids from both ends.” Pregnant women should avoid using this plant as it can cause spontaneous abortions. Also exercise caution with this plant if you are hypoglycemic because it can lower your insulin level to a dangerous level.